Freshness, quality and simplicity. The only seasoning you will need is extra-virgin olive oil. Why not try our sautéed mussels or clams too? This is one dish where mopping up every last drop is a must. A creation rich in taste and substance. This is a recipe that I used to make at home, then our chef got his hands on it and transformed it with his finesse. 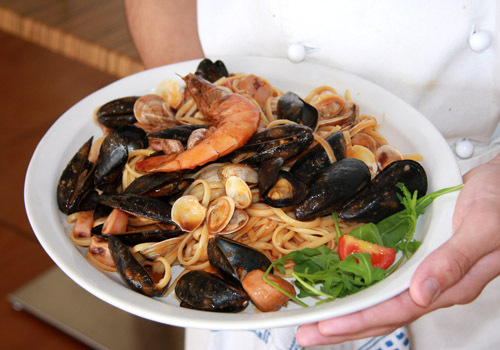 Three cooking methods in a single dish: the mussels and clams are sautéed fresh, the prawns are cooked alla busara - in a tomato sauce - and the rest is cooked with a different tomato sauce. These three cooking methods are then mixed together to become a single dish. The characteristic symbol of Grado traditional cuisine and the king of our main courses. A very controversial dish, which always leads to heated debate amongst island dwellers, each ready to defend their own version. 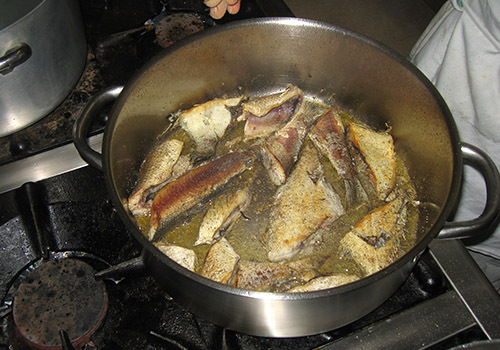 Contrary to popular belief, ‘Boreto’ isn’t a soup or even a dish, but a way to cook fish and anything else which moves around in the lagoon. 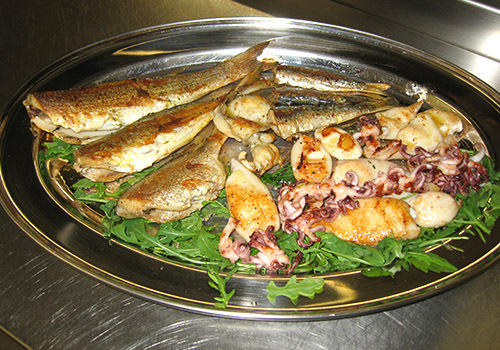 Come and taste our excellent ‘Boreto a la Graisana’ which , depending on what’s available on the day, we make it with bream, bass, turbot, grey mullet and dogfish, amongst others..
You won't find everything at the L’Approdo, only what we have selected that day from the market at Grado Port. The fish we have available depends on what the fishermen have caught that day and on the weather. When we are out of something, we check it off our fresh dish board. The next day you may find it back on our list of fresh options, or there may be something else. We're sorry for any inconvenience this might cause, however we are sure that people who love seafood will understand and appreciate it. Our menu is made up of simple dishes, created with skill and using only genuine ingredients, in pursuit of flavour through simplicity. We also take special care of those with food intolerances (e.g. celiacs). Please inform us and our cook will suggest suitable dishes for you. At L’Approdo, you won’t find everything, but only what we chose each day at the Grado port market. The availability of the fish is linked to what the fishermen bring in each day and the weather conditions. • Starter: Pasta with mussels . • Main Course: Grilled bass with polenta. • Drinks: For each member of the group, we offer ¼ house white (Pittaro Friulano DOC - San Martino), ½ still or sparkling water, espresso coffee. • Hors d'oeuvres : Sautéed mussels. 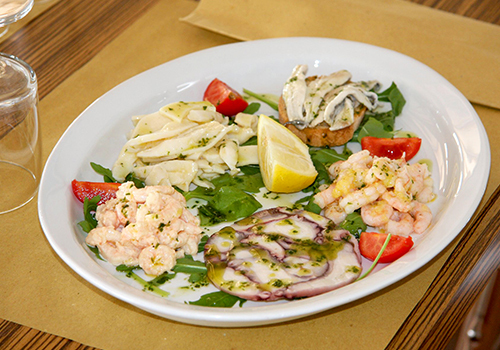 • Starter: Pasta all’Approdo (similar to ‘alla Scogliera’ but made with a ‘Busara’ sauce, which is very tasty, with tomatoes, calamari, scallops, freshly sauteéd mussels and clams, as well as scampi). • Main Course: ’Boreto alla Gradese’ with bass and polenta. • Hors d'oeuvres: Sautéed mussels and clams, mixed cold hors d'oeuvres (Prawns marinated in olive oil and lemon, Prawn cocktail, Anchovies with croutons, Cuttlefish salad, Smoked Tunafish) . • Starter: Pasta all’Approdo (similar to ‘alla Scogliera’ but made with a ‘Busara’ sauce, which is very tasty, with tomatoes, calamari, freshly sauteéd scallops, mussels and clams and scampi) . • Main Course: ‘Boreto alla Gradese’ with bass and polenta. • Dessert: Lemon sorbet, Panna cotta. Are you looking for a restaurant that welcomes large groups?We can accommodate groups of up to 80 people for business lunches, formal occasions and weddings.